Established in 2009, performing at events (private/corporate), venues and festivals across the UK. 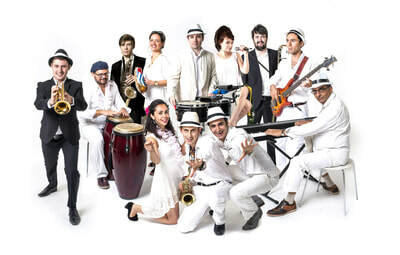 Covering a diverse range of Cuban music ranging from Traditional & Folkloric to Contemporary dance floor salsa, Latin jazz and popular music and Samba, Bossa Nova & Brazilian music. 100+ strong repertoire of songs in Spanish, Portuguese & English plus original compositions. Based in London but travelling nationally and internationally if enquired far enough in advance. Boasting over 40 brilliant reviews from some of the UK’s top venues and clients. Offering a flexible range of lineups and instrumental combinations to suit the budget and requirements of the occasion. Male & Female vocals, Lead & Backing vocals. Offering a Brazilian setup "Diáspora Brasil" if required. Offering a flexible range of support acts to further enhance the occasion: Fiesta Latina, La Charanga Diáspora (string quartet), salsa DJ/dance tuition and/or guest artists. Fluent improvisers and readers, serious about Latin music. 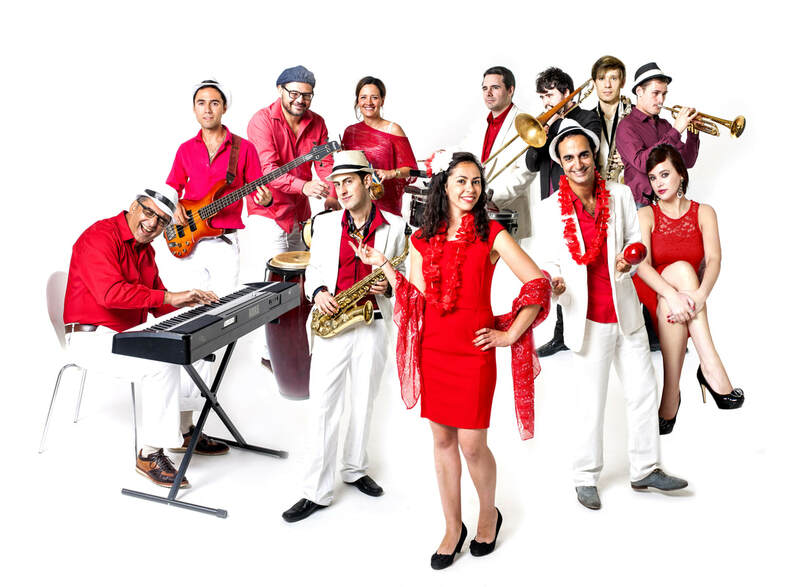 Versatile for events ranging from parties of 200+ people to medium-sized events and offering a smaller band "Fiesta Latina" either as a support or as a headline for smaller events. Providing its own P.A., sound engineers, instruments and backline plus lighting if requested. Starring some of the London's finest musicians from the best bands around, and featuring a variety of guest artists. 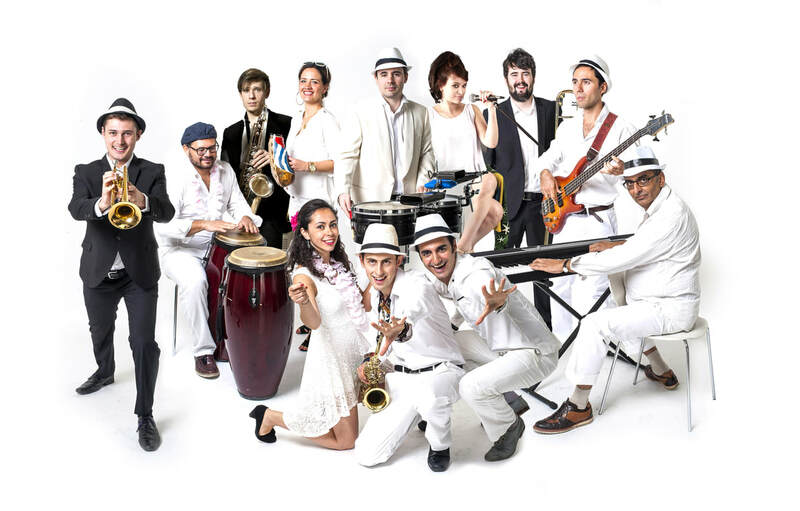 Exhilarating Latin, Afro-Cuban, Brazilian rhythms brought to you by a funky UK salsa band - vocals, horns, percussionists, available for weddings, parties, festivals and events private and corporate. Absolutely stunning. 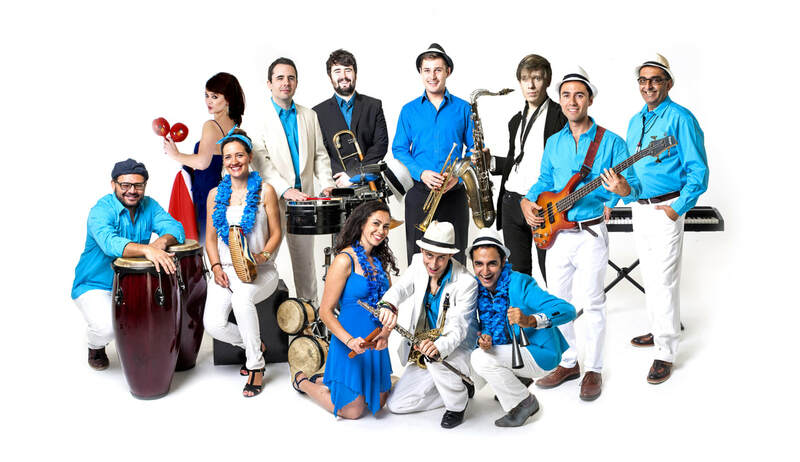 Diáspora is a London-based Latin band bringing you a one-way ticket to the music of the Americas. The 12-piece lineup (2 vocalists, 3 percussionists, 4 brass, piano and bass) lends itself to an expansive big band sound without losing the dynamism and spark of a small group, and combines sensuous vocals, sophisticated horn lines and explosive percussion solos... With their vision to unite the rhythms of the Americas, their music is uplifting, inspiring and unifying, celebrating the diversity of cultures that arose out of the African Slave Trade, whilst focusing on the Cuban, Brazilian and globalised salsa sounds which have become significant musical languages and forms of solidarity and cultural exchange among communities throughout the world. Diáspora is not your regular salsa band... it’s a Latin band, in the wider sense; freely mixing salsa with jazz, funk and contemporary popular music styles to create an explosive mix of sounds... it’s a big band by its very nature; equipped with all of the credentials to make for an exhilarating live outfit - engaging vocalists, a burning hot rhythm section and a big fat brass section... With their critically acclaimed fusion of rhythms, Diáspora is one of the most exciting new projects to emerge on the UK Latin scene today. The band were amazing. Their lively, upbeat music was a great choice for our wedding entertainment and they are obviously very talented musicians and dancers who have a love for what they do which really contributes to the great atmosphere that their music creates. They were very professional too, the contact and planning before the event was excellent and no doubt contributed to the smooth running of the evening... Importantly too, they all seemed to be nice, friendly people, and it's nice to be able to look back on the day and feel this way about everyone who contributed to the event even if they were not there as a guest. First of all, thank you to Diáspora for your understanding of our needs. - We didn't know how to book a band. - We love salsa and Cuban music but not too serious. - We didn't know much about salsa dancing. - Most of our guests were not familiar with Latin music. But we wanted to have Latin music because the wedding was in summer and it would make a difference and our guests would be interested. So we had a problem to solve and Diáspora did it. It was a calm and easy booking process. Diáspora knew exactly what we needed and took great patience to wait for us, to understand what we needed. Diáspora played salsa music as background music in early time of the reception. Our guests enjoyed their conversation, moving their bodies to the music. Surprisingly, many guests knew some of the music! And then after the dinner, Diáspora gave us a 5-minute salsa dance lesson. It was really successful!!! Many of our guests enjoyed so much to follow the rhythm, laughing at each other. After the lesson, guests were just enjoying dancing, forgetting about how to dance which is fantastic! ​Quotes are calculated by the zone, which is the number of miles from the home postcode to the venue postcode. Quotes are calculated from London. These "quick quotes" represent the highest it would ever cost for the most tight circumstances. Actual quotes will be lower! Please note: "quick quotes" and "guide quotes" are pessimistic. They represent the highest it would ever cost for the most tight circumstances. We provide these quotes to give you an approximation and properly manage your expectations. Actual quotes will always be lower! Please refer to the full technical info and/or e-mail us for an actual quotation.